So part one finished up with a Virtualbox VM , two blank disk and the OEL CD image in the virtual CD drive. Fair warning I have taken some liberty with technical preciseness of handsfree, but it's pretty close. If some knows how I can second commands to the guest from the host command line let me know, virt-install maybe. 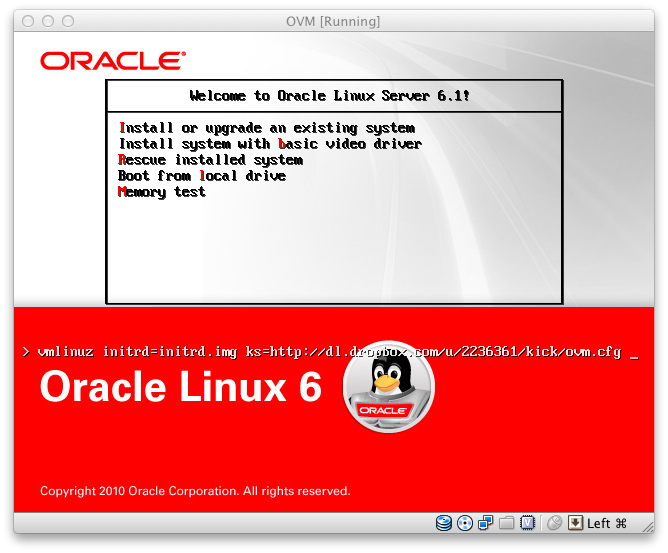 This will install OEL 6.1 on the VM that was prepared in the part 1 and power if off when the installation is finished. 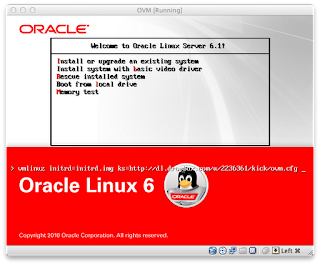 Of course you may which to download the ovm.cfg kickstart file and make changes to suit your setup. Last bit to get ready for part 3 is to attach the VM Manager software image and boot the guest up again. VBoxManage storageattach "OVM" --storagectl "IDE Controller" --type dvddrive --device 0 --port 0 --medium "/Volumes/ISO/Oracle/OracleVM-Manager-3.1.1.iso"